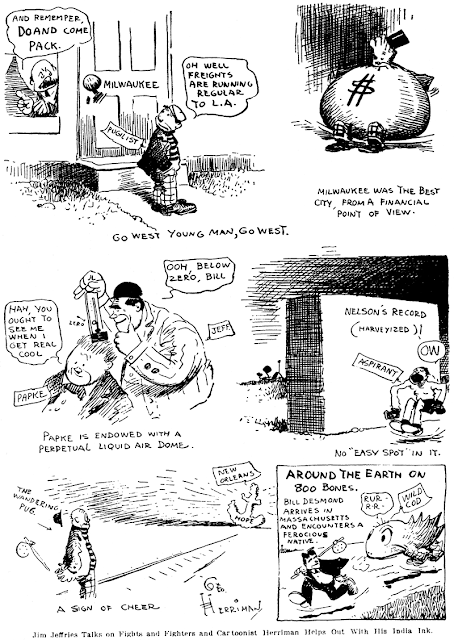 Sunday, October 18 1908 -- Herriman once again provides graphic commentary to former boxing champion Jim Jeffries' series of articles about his vocation. Although Connie is on the cusp of a new adventure, sadly we must bid her adieu at this point. Cole's run of Connie ends with this episode, and it looks like our heroine is going to be getting into some decidedly non-sci-fi adventures now anyway. If anyone can supply further Connie adventures (in good resolution, not digital microfilm) I'd be happy to keep chronicling her adventures here. Thank you Alan, and the late Cole! The story-telling in Connie is very lame, but the art is gorgeous. I like the candy-shades of the colouring, too. This strip is rarely seen, and I feel privileged to have access to it. This has been a GREAT run - thanks for sharing these gems. 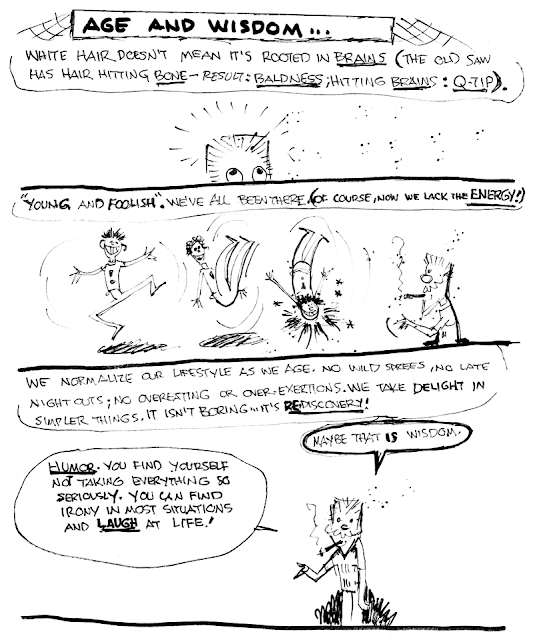 Winnipeg, Manitoba-based writer Susan Kelso came up with an intriguing cartoon idea. What if your daily horoscope did actually come true, but the result was very much different than what you envisaged when reading it. She liked the idea so much that, without knowing anything about newspaper syndication, she talked artist Eric Olson into a partnership to create and market Horrorscope. After discovering how to submit the cartoons to syndicates, the pair found no takers at the big U.S. companies. In their native Canada, however, the Toronto Star liked the cartoons and agreed to run them. Horrorscope began appearing in the Toronto Star on January 1 1990. In only a matter of months, King Features Syndicate took a second look at the cartoon and decided their initial rejection was off-base. On October 29 1990, King Features, in partnership with the Toronto Star, began international syndication of the series. The feature's rollout certainly didn't set any circulation records, but evidently there were enough clients to please the creators and syndicate. At least two reprint books were issued early in the life of the feature, a self-titled collection and More Bad News. After a five year stint Eric Olson decided to leave the feature, and another Manitoban, Adam Rickner, was brought on to take his place. Rickner lasted three years, and Carol Kemp then became the third artist on Horrorscope. 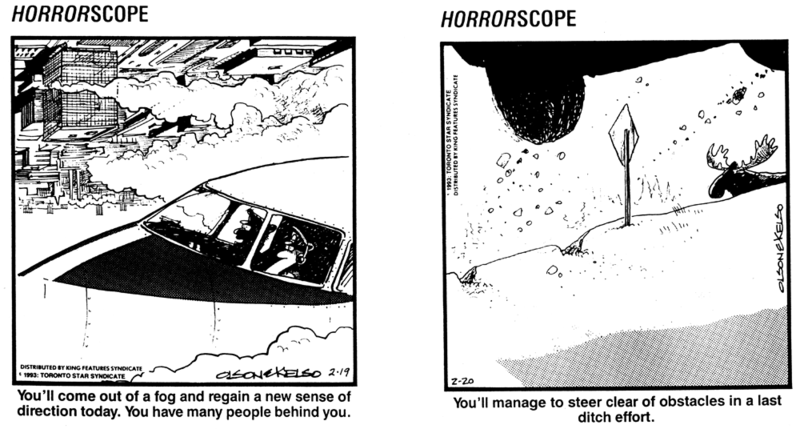 In 2000, Susan Kelso dropped out temporarily for some reason, and Kemp was credited with both art and writing for awhile. Soon Kelso was back, and the feature ran without any further creative defections until 2006, when it seems to have been dropped from syndication and from its home paper, the Toronto Star. 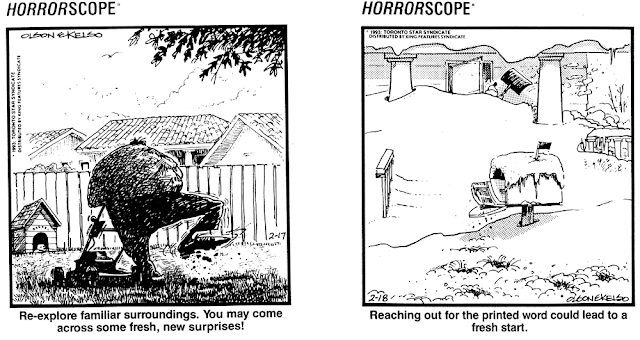 A couple oddities to note -- first, the feature was consistently advertised to have a Sunday version; I've never seen a true Sunday of Horroscope, but I have seen on a 1993 King Features proof sheet that one week's worth of the feature seemed to comprise a total of seven daily-style panels. Very unusual, to say the least. Second, in trolling around the web for information about Horrorscope, I was surprised to find that there was another daily panel by that same name that ran from 1986-89 in the San Bernadino County Sun. That one was by a fellow named John Weeks. You can check it out on newspapers.com if you are intrigued. 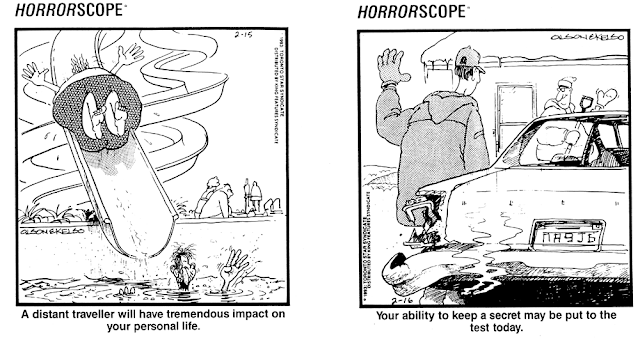 Man, I haven't thought about "Horrorscope" in years. When I lived in Japan, the Daily Yomiuri (an English-language newspaper published by Yomiuri Shimbun) ran this panel every Sunday. I believe they ran the "Sunday" panel, which was in the same black and white format as the Monday to Saturday panels. I remember Carol Kemp's art the most. It was just mentioned on RACS that Adam Rickner died last year. I next discovered that a year at Durand's under the instruction of my gifted brother and my fellow workmen, who were the best in the world, qualified me for easy admission into any other jewelry shop in Newark, and there were a dozen of them. For two or three years I led a butterfly existence, flitting from factory to factory, picking up knowledge, until I became a designer for a firm now extinct. In the old building they occupied may still be seen, I am informed, a windowpane with my name scratched on it with a diamond. It may be that they are preserving the structure as a memorial. The jewelry trade demands more than mere workmanship; it necessarily requires a high degree of character; personal honesty is as requisite as it is in banking. In all the years that I spent in engraving, only two cases of theft of gold were known. In one instance the ingenious thief used to brush his hands, dusted with fine gold filings, through his well-oiled hair and wash his spoils out at home: in the other a wire-drawer would cut off an ounce or so from the bar he was reducing to wire. The floors of the factory were of corrugated iron, to keep the gold waste from sticking to the men's shoes, and they were carefully swept every night; even the smoke of the chimneys had its gold extracted. I have often seen the floor about my stool fairly sanded with golden chips that fell from my modeling tools. This particular stool had a rather singular history in that it had been used for years before my advent by Walter Shirlaw, the distinguished artist, and after me for some years Will Crawford, the cartoonist and illustrator, occupied it. Of the experiences of my adolescence, two may be of enough interest to be recorded. One was the making of an aluminum fan for Mrs. Astor. The spreaders of this beautiful creation were made of the valuable and rare metal then recently discovered, or, rather, first obtained in workable quantity. These spreaders, after being sawed out in a filigree pattern, I carved with an intricate foliated design, with a keen pleasure at working upon this novel material. The men were constantly coming to inspect and marvel at the new metal and its almost absurd lack of weight. Had one predicted that within twenty years yachts and bathtubs would be formed of this material, he would have been regarded as harboring bats in his cupola. I have often wondered what became of this fan, for, apart from its workmanship, it soon became, I suppose, of little value and quite unsuitable for the display of wealth. The other incident held graver possibilities. On one of my idle days I was painting a little water color in the half-deserted shop, and had just returned to my seat with an old beer glass filled with water. At my side sat Dumont, the famous diamond-setter from Paris, now a Maiden Lane dealer in precious stones, at work upon a splendid tiara of very large diamonds. Suddenly a big stone, as large as one's finger nail, snapped into the air from under his tool. Fortunately the windows were closed, and so the search for the stone, worth thousands, was confined to our immediate vicinity at first, but we failed to find it. Soon everybody was engaged in the search; every box, drawer and crevice was probed, but unavailingly, and finally another large stone was substituted. The memory of the lost diamond hung over that section of the shop like a pall, and I well remember the uneasiness and anxiety of a young chain-maker, Theodore Bergdorf, who afterwards went to the Naval Academy at Annapolis and died a captain of a battleship a few years ago, and he was by no means alone in his solicitude. What secret measures were taken by the firm, I never knew. One day, about two months later, in another idle hour, I opened my color box and took up the beer glass to fill it with fresh water. There on the bench, in a circle of dust formed around the rim of the glass, lay the lost diamond twinkling merrily up at me! As it had flipped away from Dumont's grasp, it had rolled across the bench and I had set the beer glass down upon it without seeing it. Thereafter, each eager searcher had pushed the glass to and fro about the bench without lifting it, and, of course, the big stone rolled along under its hollow base. My loud yell of delighted amaze stirred the three floors of the building into life, and we held a sort of general jollification as an expression of the relief felt by all, from the "Old Man" down to the office boy. Under the circumstances, it had been possible for no employee to feel entirely free from suspicion. After the panic of 1873 business languished, and especially the making of fine jewelry, except just before Christmas, when we had to work at night. My brother in those hard times allotted the bulk of such work as there was to the married men. Hence I had plenty of time for other pursuits; fishing was good in the Passaic River, pigeon-shooting at the traps was still a popular and, for a good shot, a profitable diversion, I was devoted to sketching and chess and I had built a Rob Roy canoe after plans in an English magazine, so the lack of work never caused me either pain or worry. I opened an engraving shop in the room next to my father's studio, where I did everything from lettering coffin plates to making printer's cuts, and even occasionally painted a black eye for the victim of a combat, an object more frequently to be observed in those days than at present. I painted several hotel signs in the antique manner, made cigar-box labels for Oscar Hammerstein and other manufacturers, as did Victor Gillam, designed novelties for the newly established Celluloid Company, and now and then managed to sell a comic to Judge, Puck or Harper's. I wonder that I did not include whitewashing and umbrella-repairing among my endeavors. I offered to run a chess column for the Sunday Call and got the job—without pay! Somewhere about this time a young friend named Williams persuaded me to write for him an essay on Joan of Arc, to be read, he alleged, before a society to which he belonged. I constructed this brochure with much careful research and great pains, and long afterward learned that it had gained a substantial prize for Williams in a competition gotten up by a Brooklyn newspaper. ... It has been my misfortune to have had several such friends, but that is probably the fate of every man who regards work as a sort of pleasurable diversion. Few men have taken my money from me, but alas! how many days have I wasted in doing things for nothing! I was gradually, or by jerks, acquiring a new vocation, and it is not surprising to me now that this tendency was observed by my employers, for one of whom I painted in oil a picture of himself as a natty bass fisherman on a lake and traded it for his Parker breech-loader, much, I think, to his own astonishment. I went less and still less often to the factory, and when I finally deserted it I gave away to one of the boys a fine set of tools instead of preserving such a precious memento. As an outlet to superabundant energy and ambition, I had been writing many an article for the mere satisfaction of seeing my efforts in print, for an ancient journalistic fossil, the Newark Daily Advertiser, on which the clever Sam Chamberlain was a reporter until Bennett captured him. At Sam's suggestion I put in a bill one day. It was paid, but they never accepted any more of my stuff, and then it happened that I encountered an Italian couple who were doing a colored-chalk act in variety shows but who were desolated by the gross lack of culture in an inhospitable land. They were indeed far in advance of their time. They had dates as far West as Kansas City, but they were determined to return to Europe, intending to return for the Centennial Exposition next summer. I bought their dates for a song, engraved a small handbill setting forth the merits of "Walter Diamond, the Carbon Caricaturist," and started in to fill their dates in company with a number of performers, among whom were Charles Bigelow, afterwards a Broadway success in several shows, among them being "We, Us and Co," a play of which I was a co-author, and the strikingly beautiful Lillian White, who sang the "Songs of All Nations," waving all the national flags the while. The "Variety Show" of those days was a stench in the sensitive nostrils of the refined and the godly, to which class most of my acquaintances seemed to belong. It was dirty, disreputable and replete with rowdy unrestrained pleasures of the lowest, coarsest sort. The only women frequenting variety houses were streetwalkers and actresses, both being placed in the same category by the Pharisees of the time, and the stage was merely an adjunct to a saloon and, frequently, also to a gambling house and a brothel. Drinks were served all over the house and smoking universally permitted. The dressing rooms were often in the cellar, ghastly, rat-infested, moldy dungeons defying description, generally totally unheated and unventilated. The general conditions both before and behind the curtain would today produce an instant strike among a gang of sandhogs, and this was natural enough, as few buildings had been erected for variety purposes. Yet from such dives emerged Lillian Russell, Sadie Martinot, Fay Templeton, Mabel Fenton, Nat Goodwin, Weber and Fields, and Dave Warfield. I wisely refrained from informing my family how deeply I had sunk under my scintillant alias until I was safe in Harrisburg, Pa.
My yearning for this particular form of adventure was completely satiated by the time I sighted the muddy slow-moving Mississippi, which romantic stream was a sad disappointment. In St. Louis I first contemplated deserting, moved thereto by alluring descriptions of the hunting and trapping in the northwest territories poured into my charmed ears by a young ex-Confederate lieutenant who, being temporarily embarrassed, was willing to sell me a half-interest in a fur-trading enterprise. In Kansas City I made the decision that Newark was a pretty good place to return to. I was never tempted back into vaudeville until an offer from Keith of $500 per week to do a sketching talk entitled "The Mystery of Female Shape" lured me from my reposeful Atlantic City home in 1908, the recollection of which is still a torment, as on the night before my first appearance I fractured the little finger of my right hand and was obliged to do my stunt in severe agony. Repetition of the performance prevented proper healing for weeks. On my return from the West, I had to fill a date at Waldman's Variety Theater in Newark, and, apprehensive that I might be recognized, I decided to do my act in "blackface." In my unpretentious but realistic performance, I had to appear in the doorway of a country grocery store placarded with more or less witty price-signs, among which hung the sheets of manila paper upon which I worked, in patched juvenile attire that made me appear far younger than I was, and after falling into a barrel labeled "charcoal" I emerged with a chunk of carbon in each hand to proceed to draw what to my uncultured audiences appeared to be startling and lifelike portraits of General Grant, Peter Cooper, Ben Butler, Bill Tweed and other familiar public characters. Harry Shay, a very promising comedian who died before attaining the renown that many of his less clever rivals achieved, offered to disguise me properly, but when he had generously blackened my face and hands he dumped the box of feathery burnt cork down my back. I left a smoke screen of soot behind me as I moved, but my discomfort turned to relief when I discovered two of my cousins in the first row of seats. They did not penetrate my disguise, and years afterward one of them described to me the act of a remarkably clever kid he had once seen make some wonderful charcoal sketches at Waldman's, and hazarded a guess that I might have made good in a similar stunt. When I confessed to being the identical clever kid, I was compelled to repeat the little performance before he was convinced that I was not spoofing him. Now walking down the street in Kansas City, I encountered Buffalo Bill. It seems to me that he was not yet a colonel, however. In my gratification at the sight of a familiar face, I accosted him. He recalled me when I mentioned Colonel Joy of Newark, and took me to his hotel to dinner. When I told him that I was about to desert the footlights, he suggested that I join his company and do my little act. Had I accepted the offer, I might have anticipated Fred Remington's studies of Western life by ten years or so. The picturesque cowboy had not yet appeared with his chaps and gun, buffalo still swarmed on the plains, their hides selling for about a dollar each, and I bought for five dollars a magnificent bull's head mounted on dark wood, but I think it cost me about thirty to get it safely home. In Fort Leavenworth, whither I accompanied Cody's gang of plainsmen, buffalo-hunters and scouts, most of whom seem to have been ex-Confederate soldiers, I met Colonel John Burke, a fat, genial desperado who did his long hair up as a woman does or did, and who became Cody's press agent and advertising man. I think he knew every newspaper man of any account between San Francisco and Moscow by his first name. He bore the scars of several severe scrimmages, but I never heard him tell the same story twice about these grim reminders. At Burke's suggestion I painted my first portrait in oil, a terrible daub, of Buffalo Bill in his fringed suit of buckskin. It was transferred from the lobby of the showhouse to the hotel each day under guard, and parked at night in Cody's bedroom. He presented me with his own favorite saddle, a ponderous thing mounted in black bearskin, which, badly moth-eaten, is still among my cherished possessions. Being the first hand-painted oil portrait ever done in that section of the country, I suppose, this painting placed me upon the eminence occupied by Custer, Miles, Cody, Wild Bill Darrell and the James Brothers, and I soon received a commission to decorate the canvas side of a popular gambling house with a still-life composition representing poker-chips, coins, cards and champagne bottles. I had each day a gallery of awed and interested admirers who were uniformly well pickled at the end of my day's work. The picture was about eight feet square and was executed with house paint in the free broad manner of the most modern school. I was away ahead of my age! This masterpiece set the proprietor of the gambling house back a hundred and fifty shining silver dollars, but as he very likely took in that sum from my gallery of critics, he had little cause for complaint. Colonel Pat Donan, "The Silver-tongued Orator of the Dakotas," told me at a Clover Club dinner at Seagirt twenty years afterwards that the picture was in his possession, and, later on, Gumshoe Bill Stone, who was afterwards Senator from Missouri, assured me that it was still to be seen in a certain notorious levee resort in St. Louis. But when I visited that city in the wake of the tornado of 1896, I was unable to locate the place, although David Graham Phillips and James Creelman, expert amateur detectives, assisted in the search. Perhaps the tornado gave it the air along with the picture. For the sole purpose of inculcating probity in a decadent generation, I must record, to my eternal ignominy, one audacious and criminal deed of my early engraving days. At that period circus tickets were on sale in a certain stationery store several days in advance of the Great Show, simple yellow tickets costing fifty cents, with a miniature elephant printed on the reverse side—many of them showing palpable evidence of previous use. Who suggested the knavish plot is now unknown, but I am quite certain that it did not originate in my guileless, untainted mind. It evolved as a scandalous and wicked conspiracy to counterfeit these yellow tickets for the benefit of poor and worthy boys who belonged to our social circle and who could be depended on to appreciate pure benevolence and not blab. The son of the printer of the city directory procured the saffron-tinted cardboard, I engraved a quite exquisite replica of the tiny pachyderm, and the present austere head of a great Newark industry printed, on his little fifteen-dollar hand press, one hundred of the spurious tickets. No boy got one who was not known to be upright, honorable and trustworthy enough to follow implicitly his orders, which were to the effect that the principal criminals were to enter first in order to absolutely insure admission to them at least, in case the fraudulent nature of the pasteboards was prematurely detected. But there was not the slightest suspicion manifested, and a happy yet somewhat tremulous gang was soon lost within the vast tent and witnessing a spectacle that held an added thrill never to be duplicated in this life. A deadhead seat on a crater's edge! For about twenty years after 1886, I made almost every newspaper illustration used by Barnum's Circus, its genial treasurer, Louis Cooke, being a Newark chum, and some two decades after this disreputable (and deeply regrettable) prank I attended a dinner given to his principal aides by P. T. Barnum at Iranistan, his Bridgeport home. It was not a very lively affair—in fact, it was in marked contrast with many jovial meals I have participated in under the big tent—and when I was called upon for some remarks I told the story of the three young counterfeiters. For some reason it made a great hit, and when I had taken my seat Mr. Barnum addressed his treasurer in a thin, squeaky voice; "Mr. Cooke," he asked, "do we owe Mr. McDougall any money now?" "No, sir. I paid him off in full last week," Cooke replied. "Well, remember," drawled the great showman, "when he brings in another bill, you take off fifty dollars from it." "McDougall, I think you must have been a pretty bad boy, and how you escaped state prison I can hardly see. Now, you know that I hate rum and tobacco, but as I think you are beyond all help I am going to give you this box of cigars that somebody sent me from Cuba, instead of burning it up." Then in a furtive and hasty manner he pushed into my hands a sizable package. I think he felt guilty. "The Old Man must have recognized a kindred spirit in you!" declared Tody Hamilton afterward. "I'll swear that he never did such a thing in his life before. He came near firing me for chewing tobacco in one of his greenhouses once!" Oscar Samuel Hitt was born in Nottingham, England, on March 22, 1892, according to his World War I draft card which had his full name. Lambiek Comiclopedia said “Hitt was an American cartoonist of German descent…” International Journal of Comic Art, Volume 10, Issue 2, 2008, said Hitt was a German cartoonist. The 1901 England census recorded Hitt in the household of Oliver Altree, his maternal grandfather. Also listed was his mother, Edith, one-year-old sister, Beatrice, and uncles Percy and Alfred. On September 26, 1901, Hitt and his mother sailed from Liverpool to Boston, Massachusetts. They were on their way to Salt Lake, Utah. It’s unclear how long Hitt stayed in Utah.On June 5, 1917, Hitt signed his World War I draft card. His address was 4832 Winthrop Avenue, Chicago, Illinois. Hitt was a Chicago Herald artist who was married and had a child; the names are not known. American Newspaper Comics (2012) said Hitt’s first series was Hitt and Runn which ran in 1916-17. He drew the Katzenjammer Kids from May 28, 1917 into 1919. The copycat Mama’s Darlings started June 24, 1917 and ended August 28, 1918. The Salt Lake Telegram (Utah), February 24, 1918, published the following article. After a lingering illness extending over a period of nearly five months, William Powe, a pioneer resident of Salt Lake, died at his home, 171 Third East street, late yesterday afternoon. Mr. Powe came to Salt Lake from England twenty-six years ago, and had been engaged as a hatter in this city ever since. He was connected for some time with the firm known as the Taylor Hatters, but in late years had been in business for himself. He is survived by a widow and stepson, Oscar Hitt. Hitt has not yet been found in the 1920 U.S. Federal Census. According to the Ogden Standard-Examiner (Utah), Hitt was a cartoonist in New York City. Oscar Hitt, noted cartoonist, of New York, was a guest during the early part of the week at the residence of Mr. and Mrs. V R Reeder, Jr. Mr. Hitt will Join his wife at Springvllle. Mr. and Mrs. Hitt are to spend the summer in Utah. They will visit frequently in Salt Lake and Ogden. 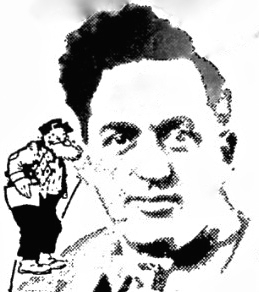 Oscar Hitt, cartoonist for the New York World, pleased the guests with cartoons which he drew upon large sheets of paper in view of his audience. Miss Fay King offered vocal selections. 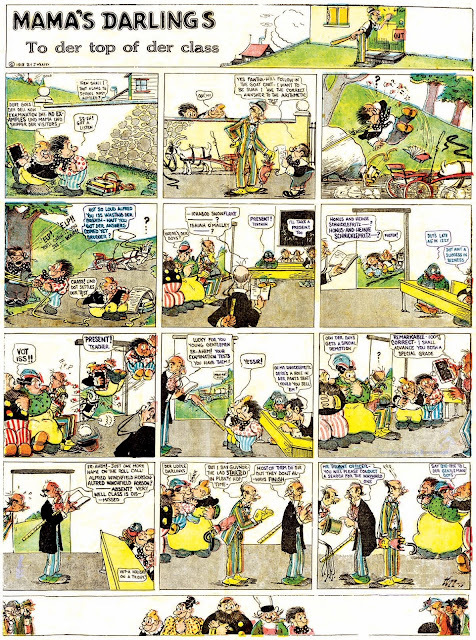 During the 1920s, Hitt drew Captain and the Kids; Ever Since Adam; Seezem and Sqeezem; Ambitious Ambrose; Hi-Way Henry; Uncle Eph Says; Wally and His Pals; and Mack and Marx (credited as Sam Hitt). In the 1930 census, Hitt lived alone in Manhattan, New York City, at 48 West 70th Street. The whereabouts of his wife and child are not known. He married at age 23 and was naturalized. His occupation was newspaper comic artist. Hitt went on a short voyage from February 29 to March 3. The passenger list said his home was the Hotel St. George in Brooklyn. The Maine Marriages, 1892–1996, at Ancestry,com, recorded Hitt’s marriage to Gladys M. McKechnie aka Gladys M. Burgess on November 24, 1933. The 1935 Florida Index listed Hitt, his wife, “Sanford May Hitt”, and son, Robert, in Miami Beach. Dude and his wife. Old Timer and his wife. © 1 c. Jan. 3, 1939; G31345. In July 1939, Hitt filed his Social Security application which identified his parents as Samuel Hitt and Edith M. Altree. According to the 1940 census, Hitt was institutionalized at the Mountain View Farm, the Home for Homeless, in Sanford, Maine. It was noted that he had four years of college education. It is not known when Hitt passed away. An obituary has not been found. Presumably, Hitt died at the institution. Despite a large field of competitors, I think Mama's Darlings may well take the prize for Most Blatant Rip-Off of the Katzenjammer Kids (I disqualify Captain and the Kids from the running since it is by the creator of the Katzies). Creator Oscar Hitt, who penned this series for the Chicago Herald's J. Keeley Syndicate, has made no other attempt to make his series differ from the original model except to rename the players -- surely naming the kids Honus and Heine Schnicklefritz will throw anyone off the scent, right? Hitt certainly had the qualifications to produce this faked up version of The Katzenjammer Kids. He was, in fact, drawing the real Katzies at the same time! 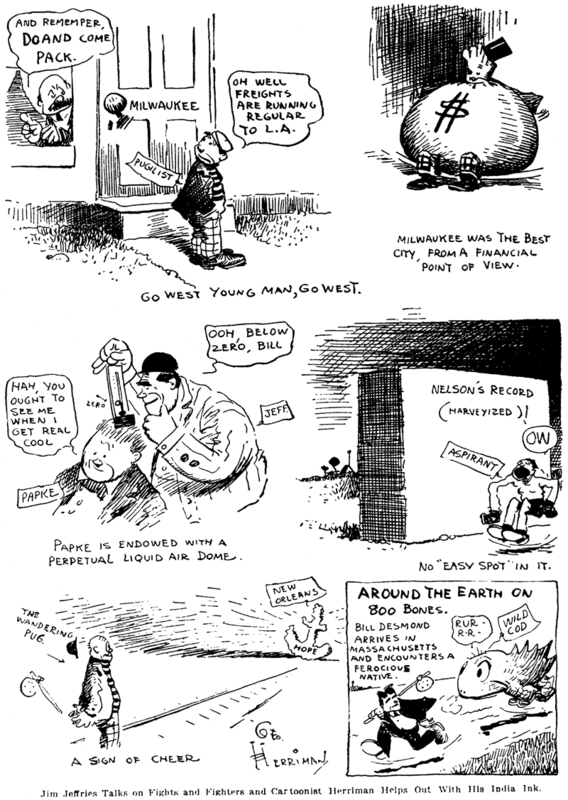 Hitt was in charge of the short-lived daily version of that strip, which ran in very few papers from 1917-1919. In fact, Oscar Hitt did such a great job of drawing both real and fake Katzies that he later got the job of ghosting art for Rudolph Dirks on Captain and the Kids in the 1920s. Proves there's even a happy ending to plagiarism sometimes. Mama's Darlings appeared in the Chicago Herald Sunday comics sections from June 24 1917 to April 28 1918. 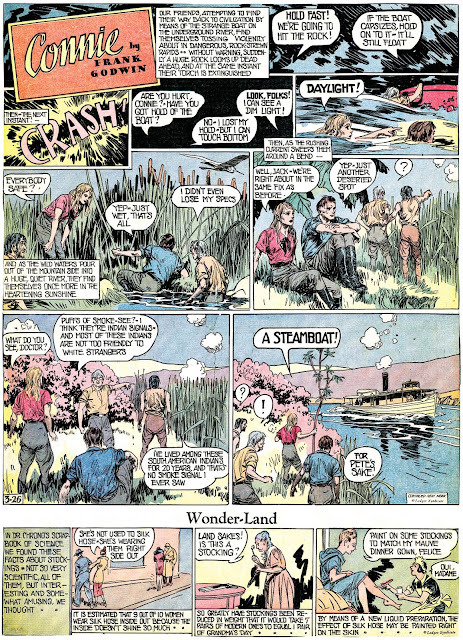 The strips were later sold in reprints to a few backwater papers by an unknown syndicate. Love the line: "We take delight in simpler things. It isn't boring... it's REdiscovery."